Repackaged and with a new foreword by the author, A.N. Wilson’s epic biography of Tolstoy is a welcome re-publication. 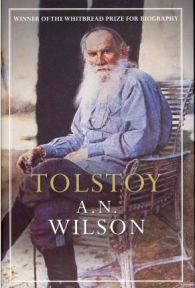 There have been countless works devoted to the Russian author, a man whose colourful life and complex beliefs make for a thoroughly thrilling and entertaining biographical work, but this one stands out thanks to Wilson’s engaging style which presents key periods of Tolstoy’s life against the backdrop of nineteenth century Russia, showing how the prevailing ideas and politics influenced his thinking. As an introduction to Tolstoy for readers who are new to the subject, this is an invaluable volume; Wilson covers all of the novels as well as Tolstoy’s most important non-fiction writing, and such content, in combination with a selective but nonetheless detailed biography, is illuminating without alienating the newcomer. For readers more familiar with the subject there are plenty of amusing and colourful details that demonstrate Wilson’s painstaking research and in depth knowledge of his subject, as well as the opportunity to consider some long held views on Tolstoy’s writing and beliefs. While many may find Wilson’s standpoint contentious, and even that it does not allow for a fuller appreciation of the Russian’s philosophy, it does at offer an alternative view of Tolstoy’s work and should make for some lively debate even if readers do not share Wilson’s opinion. When writing about Tolstoy’s novels, Wilson is more than agreeable but I find that he gives too much of himself when writing about his non-fiction works and discussing his philosophies, and in some sections he risks making himself the subject of another man’s biography. The main issue is Wilson’s dismissal of Tolstoy’s religious views, something the author does quite vehemently and this results in an account that does not and, in my opinion, can not, truly examine the Russian’s way of thinking and how it influenced not only his writing but also his personal relationships. While the biographical detail and the critical appraisal (as much as one can in a work of this length) make this a suitable read for Tolstoy beginners, Wilson’s vociferous rejection of Tolstoy’s views on Christianity mean that important aspects of his life are brushed over and, for me, these are among the most interesting details (e.g. his rejection of a life bathed in privilege in favour of a simple, peasant lifestyle; opposition of militarism; and an appreciation of nature). In fact, Wilson is often close to scathing in expressing his view that although Tolstoy made much of his own rejection of his wealth and family status, he was actually only able to enjoy his playing at being a peasant because of the generosity of his independently wealthy and long suffering wife. On the other hand, Wilson’s appraisal of Tolstoy’s novels is positively glowing and demonstrates a genuine affection for the works of one of the greats of nineteenth century literature. What stands out about this book is the way that Wilson has contextualised these wonderful novels. While critics have often maintained that the Russian wrote novels that mirrored the events of his own life, Wilson rejects this to some extent and shows instead how his writing is actually influenced by his relationship with his country and his spiritual stance. Examined in the context of time and place, Tolstoy’s novels take on a new vibrancy with Wilson’s appraisals and I found myself inspired to reach for a much loved and badly dog eared paperback of Anna Karenina to read with what felt like fresh eyes. Wilson’s highly readable style keeps things moving at a brisk but manageable pace and even in the heaviest sections he avoids sounding excessively scholarly, though you might argue that when he is lavishing praise on his subject he is excessively and almost embarrassingly flowery. Still, the enthusiasm is infectious and the knowledge unrivaled, making this a less daunting proposition than its almost six hundred pages might suggest. There are moments here where Wilson is a brilliant biographer but ultimately he brings too much of himself into play; nonetheless this is a wonderful look at Tolstoy and his work, even if it focuses too heavily on his life and not sufficiently on his death. It is required reading for both newcomers to Tolstoy and to those familiar with his writing and philosophy. With thanks to Atlantic Books for sending a review copy.